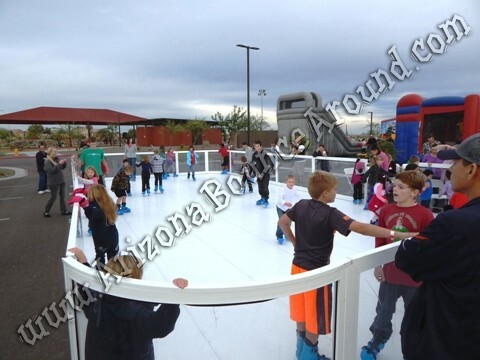 Our new portable ice skating rinks are truly portable and is completely synthetic ice so no freezers or frequent maintenance required for this ice skating rink. 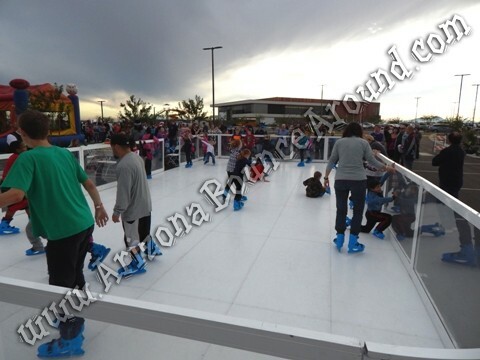 Our ice skating rinks start at 1,196sf (26 feet wide by 46 feet long) of pure fun and can be setup indoors or out, on the beach or in your parking lot. We offer many different sizes and shapes of ice rink rentals so please call us with your needs for a quick quote 719-531-7510. 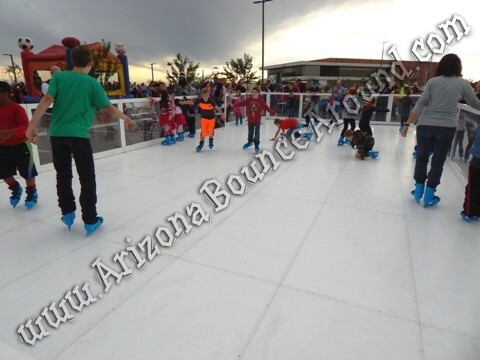 Some of the photos shown are of different size portable ice skating rinks we offer and with and without open centers. 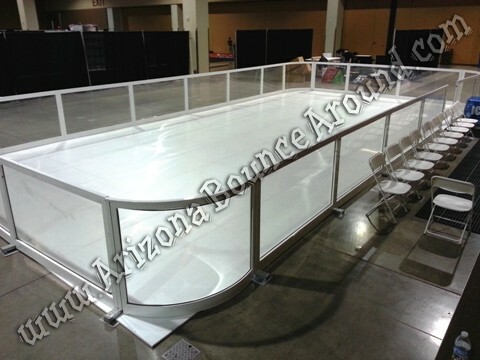 We can put the seating area on any side of the ice rink and the space needed for that is 10' wide by 20' long. This measurement is not included in the space requirements. 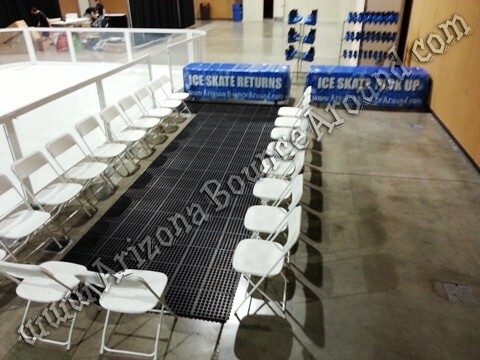 We can make the seating area smaller or larger depending on the size of rink you need. Be sure to check out our new snow slide tunnel perfect for big parties or events. 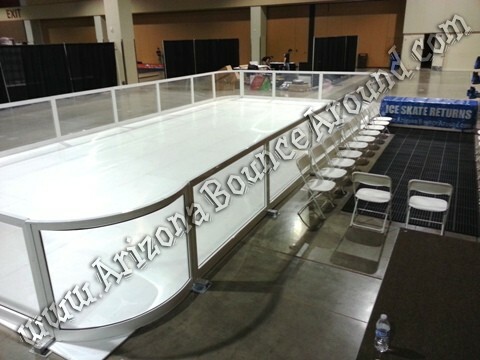 Our Ice Skating rink rental price is for flat level setup on concrete, carpet, tile, etc. without an open center. The open center adds $250.00 to the rental price and makes the ice rink look great. It's the perfect place for props or snow machines. 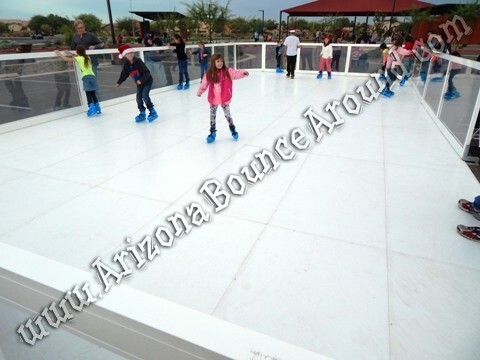 Our ice skating rink comes complete with ice skates in various sizes, Ice skate rack, chairs and professional aluminum fencing. We provide staff to help with proper skate sizing and can even provide holiday music, artificial snow fall, snow globes and sleigh rides. You can even zip line over the synthetic ice rink or ride a mechanical reindeer for the ultimate holiday party or event. No holiday Christmas party is complete without a train ride and we have the perfect Trackless Train to complete the party. If you're in charge of the holiday corporate party or city festival this year then let us help you make the crowd go WOW, That party was amazing. 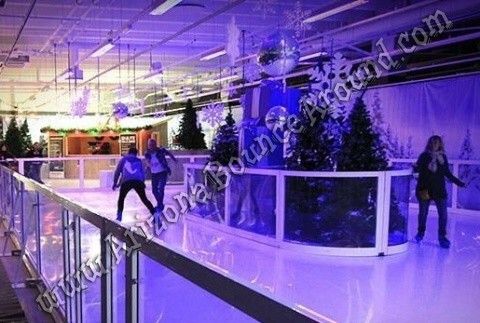 Our synthetic ice rink rentals provide a unique setting for your winter party theme. 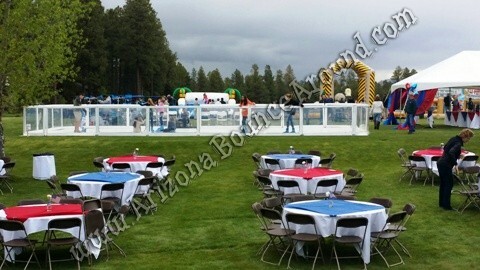 A synthetic ice rink makes the perfect centerpiece for your special winter event, creating a fantastic Christmas skating party or a fabulous New Year’s Eve celebration. Our synthetic ice rinks are made from hi tech plastic polymer which mimics skating on real ice. 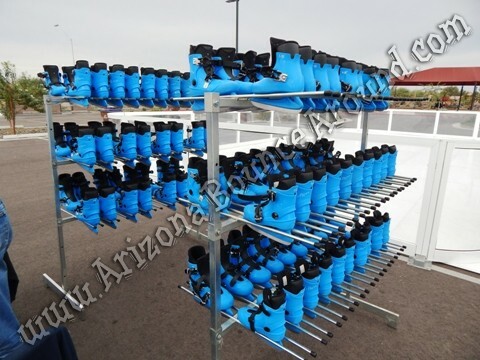 For every winter event package, we offer the ice rink supplies and skating equipment to make your event come together smoothly. You can add special event lighting, snow machines, holiday themed props and snow globes. We also rent heaters so be sure to add them to your order. 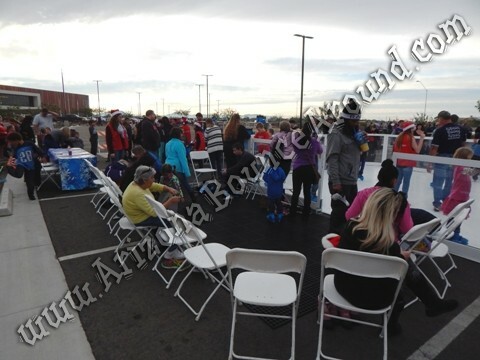 Plenty of room for for kids and adults to enjoy ice skating in the desert together. 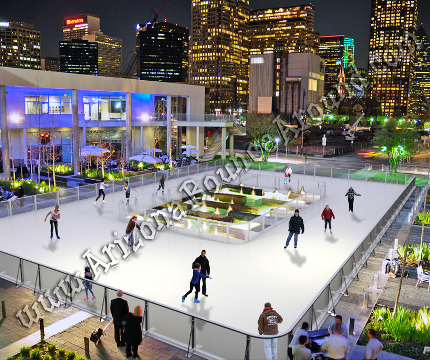 Our ice rink will hold up to 50 skaters at a time. Our super fast synthetic ice rink is the only portable ice skating rink that does not require lubricant to be added to the surface for use. This may sound simple but you should ask these questions before renting ice skating rinks because your guests will not like having that on clothing when they fall down. 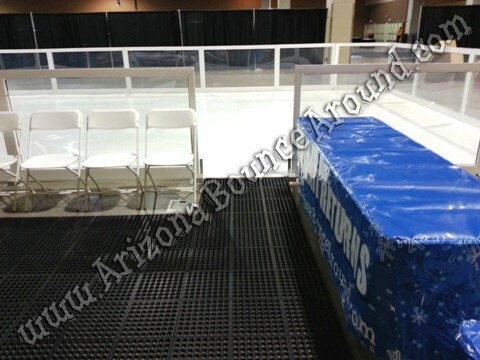 We provide a spacious seating area complete with rubber floor when putting on ice skates and taking them off. 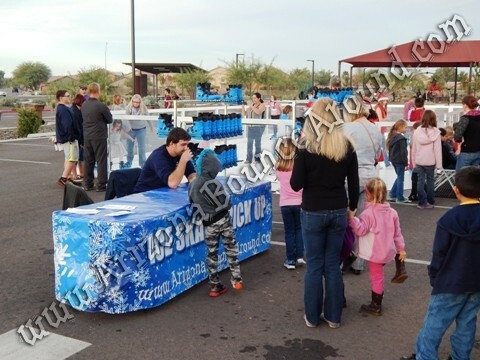 Our ice rink rental price includes 50 pair of ice skates in various sizes including toddlers, kids and adults. It also includes 2 ice skate racks for quick sorting and selection. Our ice skates are very high quality with plenty of ankle support and quick adjustments for ease of use for high attendance events. Add black lights to your ice skating rink for a really cool effect. We can also add an open center for Christmas or holiday props as shown in the photo above and below.